We feature eyeglasses lenses by Essior — the makers of Varilux and Crizal. We utilize numerous frame manufacturers to bring you an exceptional variety of styles to fit any budget. We work with all major manufacturers of contact lenses to be able to provide the best lenses available. 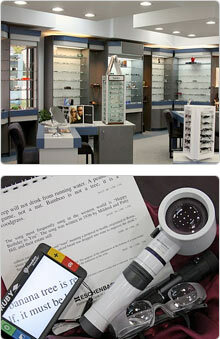 Our doctors will work with you to find the best product for your vision needs. We can order from most vendors and stock items for demonstration from Eschenbach and Freedom Scientific.